I love sticky notes, and I’ve used them to organize my thoughts for years, but that method has some problems: notes fly off the paper, or you have to rewrite the same things several times as you move your notes around. Plus there’s the space issue. Where can you stick enough notes to outline an entire novel, and how can you back that up reliably? Scapple to the rescue! The Scrivener writing program from Literature and Latte has achieved a certain level of recognition in the writing community, but L&L’s other program, Scapple, has flown under the radar. I can’t imagine why, because it’s equally well-designed and may be even more useful depending on how you like to work. It’s something like mind-mapping software, but with more flexibility — L&L calls it a “freeform text editor” and that seems the most accurate description. You type, and then you can copy/paste or format your text however you like, but you can also stick each piece of text anywhere on your infinitely-large page and connect them with lines or arrows any way you want. Again, Scapple isn’t exactly mind-map software, but for me that’s an advantage. I don’t have to force my mind to be mapped according to someone else’s system. I don’t have to know what I’m doing right away, decide which idea is “central,” or anything like that. I can just start and figure it out as I go along. The main way I use Scapple is actually to create character charts, and it’s a huge step up from either mind-mapping or family tree software… I need a chart that can show relationships, but not just familial ones, and also show the passage of time to some extent. Note how I can have a mindmap with two connected centers, plus a list on the side, and then some special charts underneath (I use the system outlined in My Story Can Beat Up Your Story by Jeffrey Alan Schechter). Some of the character relationships are romantic, some are parental, some are adversarial or professional, and a few don’t show up until halfway through the book, but I don’t need a way to track all that because I know who’s who. I just needed a way to combine “list of characters” with “immediately-visible connections.” That helps me craft a plot that makes sense, without forgetting anything obvious. Scapple is great for exploded-view lists like this. Many writers enjoy using standardized character sheets or questionnaires, both to keep track of their characters and to learn about their personalities. I often feel like these methods take some life out of my characters, though, so I needed a more organic way of keeping notes on personalities and character arcs. Note the ability to drag-and-drop images! I also love being able to mix and match “forms” that I can fill out or reimagine as needed, so I can combine plot notes with character notes. There are shortened versions of three “systems” in the sheet above, plus an unordered list of relevant information about the character and another list of relationships sorted by type. The next character sheet sits directly to the right in the same document and so on, because I like to see everything at once, but obviously you can set that up however you want! I love all my character charts and sheets, but outlining is where Scapple really shines. It can handle complexity, and your own uncertainty about which ideas go where. Plus, I tend to change my visual outline structure depending on the project, and Scapple is totally flexible for that. There are four columns there, although muddled a bit: the left-hand column in the box(es) is a blank list of scenes, the guide to where my outline should be. (Again, I’m using Schechter’s system, but all this business of putting it into Scapple is my own design.) Then I have two columns tracing two characters’ arcs on each side, and the yellow notes down the center mark what the villain’s doing at the same time. The red ones are obvious questions to answer. With this one I already know how it goes, and it’s a more linear space-travel story, so I’m basically outlining as I go along to have a clear reference for where I am in the plot. If I run into problems I can outline ahead to fix them, or I can go through and colorcode existing notes to highlight problems or check rhythm. It’s a completely different story with very different needs, but Scapple can do both without any fuss at all. And worry not, you can back up your work in several formats. Plus, if you’re also using Scrivener you can drag notes straight into that. For me, though, I just adore being able to get my thoughts directly onto the page. I don’t have to force them to make sense, and I don’t have to remember how they relate, I can just draw them in however seems reasonable at the time. Then, unlike any kind of paper notes, I can immediately start working with what I scribbled down. Move it around, highlight it, draw lines, make a chart, anything I want. 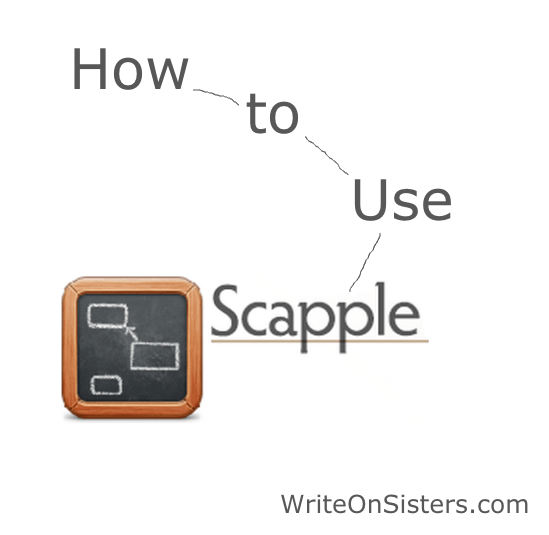 If you’ve struggled to use pre-structured methods, been inspired by worksheets but haven’t found the exact right thing, or just desperately wanted electronic sticky notes in your life, Scapple may be for you. Either way, I hope this post gave you some organizational inspiration! Hannah Givens is a lifelong book lover, student of literary history, and writer of numerous term papers. She blogs about genres of all kinds at Hannah Reads Books, and is currently working on her first novel. She can also be found on Facebook and Twitter, talking about books and much more. It’s never really occurred to me to use pictures in scapple (in part because using pictures rarely occurs to me anyway) but I love the program the way I’m using it anyway xD I use it to do a mix of mind-mapping and outlining (at least, visually it’s a mixture of the those two above). I use primarily smaller boxes, but I can definitely see the appeal of those large boxes as well. Thanks, Hannah! I use Scapple already, but hadn’t thought about using it for Character connections. And I didn’t realize I could drop pictures into the program either. Great tips!